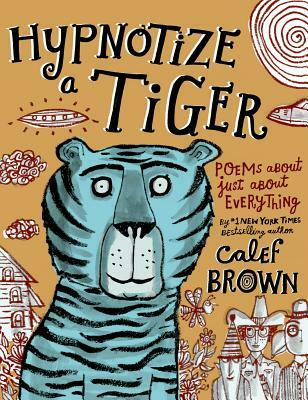 This is the first longer-format, middle-grade collection from #1 New York Times–bestselling author-illustrator Calef Brown. Moving away from the picture book format offers Calef the opportunity to tackle a variety of themes and poetry styles as well as reach a slightly older audience. Hypnotize a Tiger is chock-full of Calef's zany black-and-white artwork and features his wonderfully inventive characters and worlds—from the "completely nonviolent and silent" Lou Gnome to Percival, the impetuous (and none-too-sensible) lad who believes he is invincible, to Hugh Jarm (who has a huge arm, natch!). It's a whimsical world: creative, fun, and inspiring! “In your hands you hold a very special book. Get ready to meet a spectacular and hilarious cast of delightfully goofy and whimsical characters that live in each of these delicious poems. Calef Brown has made me feel like a mustached baby tasting sugar for the first time!” —Jorge R. Gutierrez, director of "The Book of Life" and creator (with wife Sandra Equihua) of "El Tigre, The Adventures of Manny Rivera"